Here we define & discuss "Yankee Gutters" or board-on-roof gutter systems, including how these gutters are built, re-lined, or re-constructed. 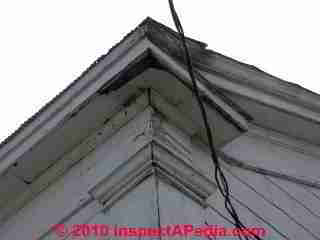 We also discuss how both Yankee gutters and integral or eaves-trough gutters are abandoned on buildings. Here we also comment on NO-GUTTER SYSTEMS - eaves attachments that claim to make gutters unnecessary. This article series discusses how to choose, install, diagnose & maintain roof gutters & downspouts, & roof drainage systems to prevent building leaks and water entry. 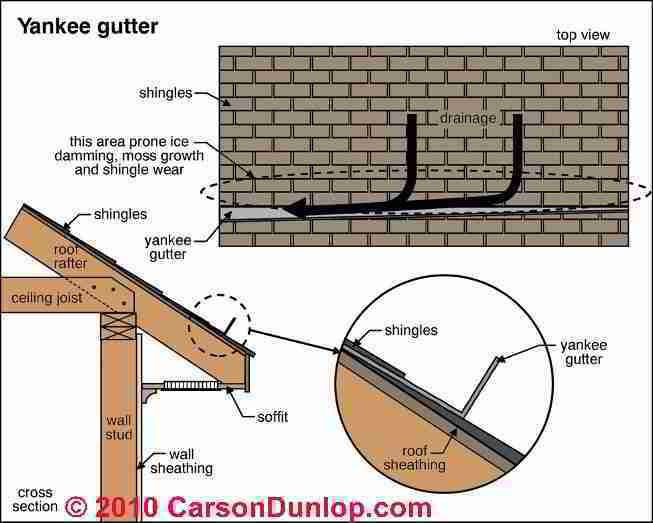 Yankee Gutters are a second on-roof site-built gutter system that we illustrate below. A board is set on edge on the roof slope to form a gutter. the downspout connection must pass through the roof deck and eaves. 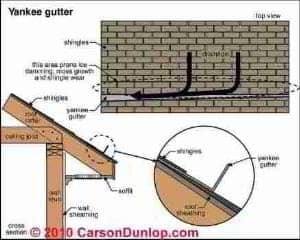 Yankee gutters were simpler in design to install than an integral eaves trough system: a board is set at right angles to the roof slope and supported by brackets. The "Vee" formed by the board set on the roof slope was lined (originally) with terne metal, lead plated tin, or copper, and joints were usually soldered. Repair of a yankee gutter, if we are just re-lining the gutter, use the same methods as we described above for eaves trough or integral roof gutters. Sketch above was provided courtesy of Carson Dunlop Associates. Our Yankee gutter photos below show a traditional board and bracket design (below left) and a yankee gutter rebuild (right). In our right hand photo we combine photos of a yankee gutter installation in process by the author (DF) on a home in Poughkeepsie, NY. We combined two photos to show some of the steps taken to protect the roof eaves from leakage. In this yankee gutter rebuild we used treated 5/4 lumber for our gutter board and for the supporting gutter brackets (not shown). We removed the old yankee gutter completely (it was rotted). Roofing felt (not shown) was installed extending up under the roof shingles above the gutter, as was solid copper flashing (shown in our photo at right) as well as copper drip edge. Set in a bed of caulk, the yankee gutter board was set onto and screwed through the copper into the roof deck. 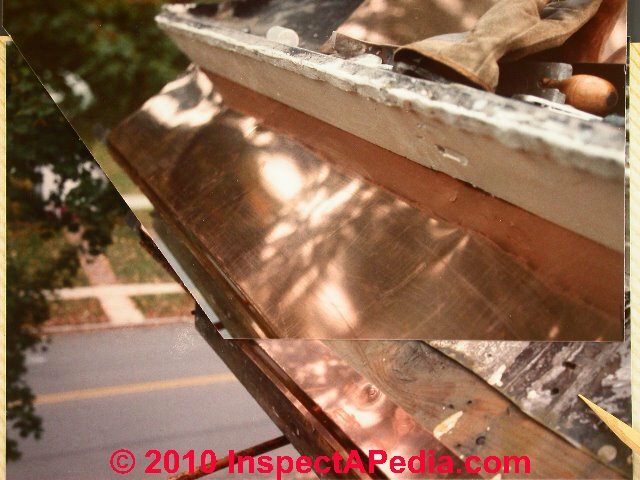 Each penetration through the copper eaves flashing was sealed by applying a blob of 50 year caulk on the under-side of the board or bracket where the screw would penetrate. But that step was just extra "insurance". The main protection against yankee gutter leaks into the roof structure, building eaves, or walls was and remains the quality and detailing of installation of the gutter liner itself. You can see that we had lined the new yankee gutter with copper that was bent over the top edge of the gutter board. When that installation was complete we installed and sealed our gutter brackets at 16" o.c. (older roofs used 24" o.c.) for a gutter that was strong enough that if a roofer walked in it we had no worry that everyone would fall to earth. A cheaper retrofit that can be used when the gutter boards and roof are not rotted, is a gutter re-lining using glued EPDM roofing or torch-down modified bitumen roofing. The advantage of the modified bitumen gutter liner for roofs where the gutters are visible is that it can be painted with silver roof paint to look just like the original installation. Watch out: if you are going to use any heat-based gutter repair approach such as soldering or using a torch-down modified bitumen gutter liner there is risk that you'll set the building on fire. When we used torch-down modified bitumen to repair eaves trough gutters we stationed an observer inside the building attic as well as on the ground below, and we had fire extinguishing devices or a water hose immediately at hand. These worries explain why some gutter repair companies prefer to use glued-up single ply membrane. Watch out: if your glued-up single ply membrane gutter repair is not installed perfectly, the seams may leak into the structure just as did the old gutter. Can I Repair Leaky Yankee Gutters or Eaves Trough Gutters Using EPDM Liquid Rubber? We have made successful temporary patches in leaky eaves trough & yankee gutter systems using mesh and flashing cement, and using glue-down EPDM roof flashing tapes as well as glue-down patches using roofing material & flashing cement. For badly-damaged eaves trough or yankee gutter systems or for systems subject to significant thermal or other movement, I'd worry about any coating's ability to withstand significant thermal movement in the gutter and its parts. However some EPDM coatings (see list below) are described as usable on metal roofing so may work as well in re-lining a leaky gutter system. Watch out: for both eaves trough gutters or yankee gutters, the most common and damaging leak point usually occurs at the penetration through the roof structure or building eaves to fit a downspout. Because this was such a common and problematic leak point, and because repair of badly-damaged (rotted) eaves trough and yankee gutters is labor intensive, some building owners decide to abandon the original roof gutter design. For abandoning an eaves trough gutter the abandonment consists in "roofing over" the old trough, typically using solid metal or a membrane roof material. 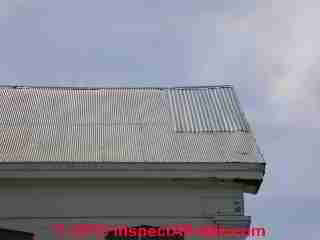 Our photos (below) show that an original eaves-trough gutter was "roofed over" using corrugated metal barn roofing. Unfortunately the building now has no gutter system at all, and a soaking wet basement. Watch out: because some eaves trough gutters project horizontally in front of the original roof eaves, if you simply "roof over" the horizontal structure of the eaves trough you'll be creating a "flat roof" slope at the lower end of the main roof. Such a design in areas of snow fall are prone to snow and ice dam backups and leaks through the roof itself. 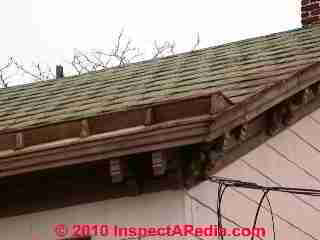 For abandoning a yankee gutter the abandonment is simpler than for an eaves trough: the original board and brackets are removed from the roof and the contractor either extends the existing type of roof coverage down to the roof edge or eaves, or s/he installs solid metal flashing all along the roof eaves. In both cases a modern gutter is then secured to the edge of the building roof, disregarding any architectural or aesthetic issues that may have been created. What about products sold as a "substitute for gutters" such as rain dispersant louvers that are installed at roof edges? Our OPINION is that roof edge drainage louvers or "gutterless" systems are useful if your building is in an area where there is rarely any rainfall, or if you have installed an extensive sub-soil water interception system around a building to perfectly protect the foundation from leaks and water entry (such as buried horizontal geotextiles and gravel that collect all surface water and conduct it away from the building). Watch out: otherwise, your roof runoff will still spill close to the building where that concentration of water invites basement or crawl space water entry and related damage. Continue reading at GUTTER REPAIR, LEAKY JOINT or select a topic from closely-related articles below, or see our complete INDEX to RELATED ARTICLES below. 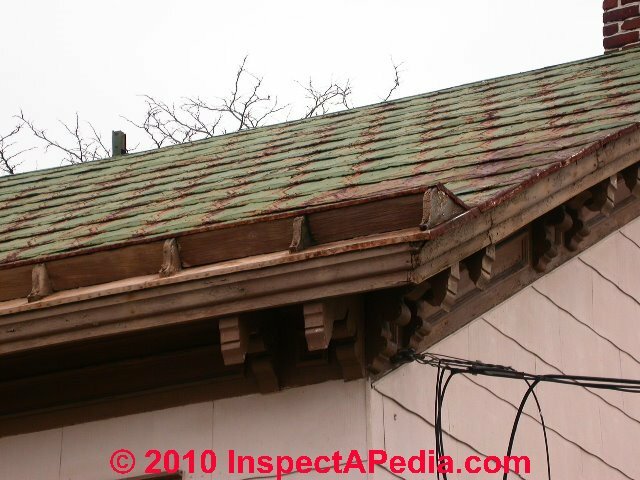 YANKEE GUTTERS at InspectApedia.com - online encyclopedia of building & environmental inspection, testing, diagnosis, repair, & problem prevention advice. Questions & answers or comments about building or repairing yankee roof gutters.